CorrectiveSolutions is the leading administrator of pre-charge, pre-file and deferred prosecution programs for adults and juveniles. These programs range from simple education programs to complex programs with local staff and multiple conditions. CorrectiveSolutions offers state of the art, evidence-based online offender courses. These courses are live, monitored, and taught by qualified instructors. Our webinars are currently utilized in over 140 jurisdictions in 17 states. CorrectiveSolutions provides full service offender monitoring including GPS, RF curfew monitoring, alcohol monitoring and probation supervision services, including installation, troubleshooting, notifications, incident investigation, payment management, and reporting. CorrectiveSolutions offers offender funded offender program administration and monitoring services for every phase of the criminal justice system. We are the leading nation-wide administrator and manager of alternatives to prosecution and incarceration programs. The RISE Program kicks off in San Bernardino! On October 7, 2015, heralded by both the District Attorney's Office and the Public Defender's Office, CorrectiveSolutions kicked off the RISE program in San Bernardino. Eligible participants will be required to complete multiple conditions that may include community service, offender classes, and drug testing over the course of the 4 month program. "It's an opportunity for the first-time offender to avoid a conviction, because there are collateral consequences associated with a criminal conviction..." -San Bernardino County Public Defender Phyllis Morris-Green. Misdemeanor diversion has become more important than ever in California with the passing of Proposition 47 in 2014, which converted some felonies into misdemeanors and increased misdemeanor caseloads. 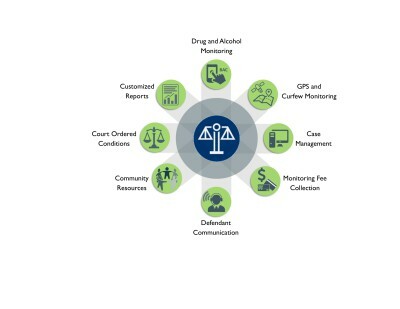 Diversion is a useful rehabilitative alternative to time consuming and resource draining misdemeanor trials and convictions. On December 31, 2015, the Citizen-Times editorial board backed Buncombe County's (28th Judicial District in North Carolina) diversion program administered by CorrectiveSolutions. "Buncombe County's new diversion program has the potential to help both the criminal justice system and some of the people caught up in it." The diversion program applies to minor offenses such as larceny, marijuana possession or possession of alcohol by a minor. "Overcrowding of the nation's prisons and jails is a problem recognized by the people ranging from do-gooders on the left to the Koch brothers on the right. We are locking up far too many people, especially those convicted of minor drug offenses. Any program that lessens the jail population while at the same time making defendants understand that their actions come at a cost is a worthy endeavor." In addition to North Carolina's 28th Judicial District, CorrectiveSolutions administers a similar diversion program in the 2nd Judicial District in eastern North Carolina.